Sire: Blackgate Lodge Picasso, Grandsire Blackgate Lodge Marquiss, Granddam Loose Beare Seventh Gate. 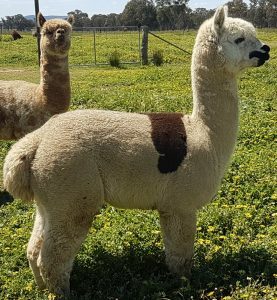 Dam: Petlyn Park Rajani, Grandsire Samaria Valley Saladin, Granddam Petlyn Park Bianca. Apatche has had an excellent show record and was shown regularly at all levels of shows including Best Fancy Huacaya. He has a high frequency crimp and stylish long fleece that is even across his body. His dark coloured spots are of equal quality to the white. His histogram results backup his fineness and lack of medulated fibre. While he is related to a lot of our females we have been able to use him over a varied selection of girls and the results have been impressive. He seems to throw broken coloured projeny over broken coloured females and solid progeny over solid females and has always improved micron and SD. 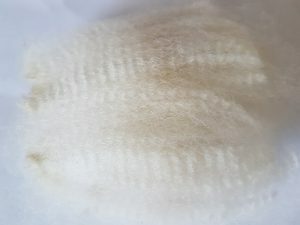 The fleece photo is of his 2016 sample and it was 115 mm long at 79 months of age and still has a very defined crimp style.